Version 5.6 A newer version is available at the documentation home. This document describes two functional modules of the CUBA platform, which display charts and geographic maps respectively. These subsystems are implemented in the same base project – charts – and thus can only be included in an application project together. Charts and map display functionality is currently available only for the web client. This manual is intended for developers building applications using CUBA platform. It is assumed that the reader is familiar with the Developer's Manual, which is available at www.cuba-platform.com/manual. This guide, as well as any other documentation on CUBA platform, is available at www.cuba-platform.com/manual. CUBA charts display subsystem implementation is based on AmCharts library, therefore familiarity with this library may be beneficial. See www.amcharts.com. If you have any feedback or would like to suggest an improvement for this manual, please contact support at www.cuba-platform.com/support/topics. If you find an error in this document, please specify the section number and attach a small piece of surrounding text to help us find it. CUBA platform charts display subsystem supports various chart types: pie charts, line plots, bubble charts, radar charts, funnel charts and more. It is also possible to export charts. Most chart types support zoom and scrolling. At the moment of writing, the chart display subsystem supports only the Web Client for Vaadin7. AmCharts library which is the basis of the chart display subsystem is distributed under a license, which allows its free use if you keep the link to the library website. Alternatively, you can purchase an AmCharts license for your project and remove the link. Charts are displayed using the Chart component acting as a universal canvas. Chart type is defined by the configuration property, which has the AbstractChart type. Any configuration attribute can be set to null; in this case the system will use the default value (except the cases specified in the AmCharts documentation). There are two ways how you can pass data to a chart: through the DataProvider interface or using the datasource mechanism. The DataProvider interface has a standard implementation: ListDataProvider class. It contains a list of DataItem instances, each one containing a set of key-value pairs. An instance of DataProvider is passed to the setDataProvider() method of chart configuration. This approach to providing chart data is the most universal, but it requires you to create instances of DataProvider and DataItem in a screen controller. A CollectionDatasource type datasource can be assigned to a Chart component by invoking the setDatasource() method. This approach requires an entity that will represent chart data. It may be convenient when such entity already exists in the application data model and also when chart data should be displayed as a table. Section 1.4, “Example of Working with Charts” illustrates both approaches to providing chart data. Entity properties or the values contained in an instance of DataProvider which are used for display purposes are defined in the chart attributes. The set of chart attributes may differ for different chart types. For example, for the chart:pieChart component, you should define the valueField and titleField attributes. The following types are allowed for attribute values: Integer, Long, Double, String, Boolean, Date. Dynamic addition of data to an existing chart is not supported; you should redraw the entire chart to display new data. This can be done using the repaint() method. AxisZoomListener - chart axis scaling. ChartClickListener - click on the canvas. RightClickListener - right click on the canvas. CursorPeriodSelectListener - selection of the display period with a cursor. CursorZoomListener - scaling of the chart area with a cursor. GraphClickListener - click on a graph. GraphItemClickListener - click on a graph item. LegendItemHideListener - hiding a legend item. LegendItemShowListener - showing a legend item. LegendItemClickListener - click on a legend item. SliceClickListener - click on a slice in a pie chart. SliceRightClickListener - right-click on a slice in a pie chart. SlicePullInListener - shift of a slice of a pie chart into the chart. SlicePullOutListener - shift of a slice of a pie chart out of the chart. ZoomListener - scaling of the canvas. Event handling examples are available in Section 1.4.4, “Using Events”. This chapter shows how you can use the chart display subsystem using the sample Library application which can be downloaded by means of CUBA Studio. Run CUBA Studio, go to Open project > Samples window and download the Library project. Open the Library project in Studio. Open Project properties -> Edit and include the charts project into the list of Base projects; save changes. Confirm when Studio will suggest recreating Gradle scripts. Select Run -> Deploy. At this point, the application will be assembled and deployed to the Tomcat application server located at build/tomcat. Create the application database by selecting Run -> Create database. Select Build -> Create or update IDEA project files to create project files for IntelliJ IDEA. Once the steps above are complete, the chart display functionality will be connected to the application and ready to be used. In this section, we shall create a service allowing us to extract data for the chart from the database. One of the methods of the service will return a list of non-persistent entities, therefore let us start by creating and registering a class for this entity. An interface and a service class can be created using CUBA Studio. For this, open the Services tab of the navigation panel and click New. In a window that opens, fill in the Interface field with the following value: com.sample.library.service.StatisticsService. Bean and Service name fields will be updated with suitable values of com.sample.library.service.StatisticsServiceBean and library_StatisticsService respectively. Save changes. 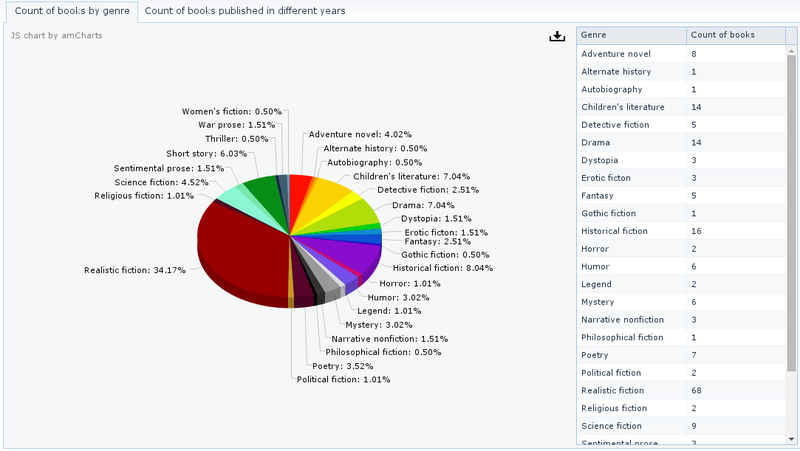 The getCountOfBooksByGenre() method returns the number of books of every genre as a list of BooksByGenre entities. The getTopPublishers(int count) method sorts publishers by the number of issued books available in the library in descending order, and returns the first count of publishers. The getCountOfBooksByPublisherAndYear() method returns the number of books issued by publishers in a given year. The chart retrieves data from the pieDs datasource defined in the datasource attribute. 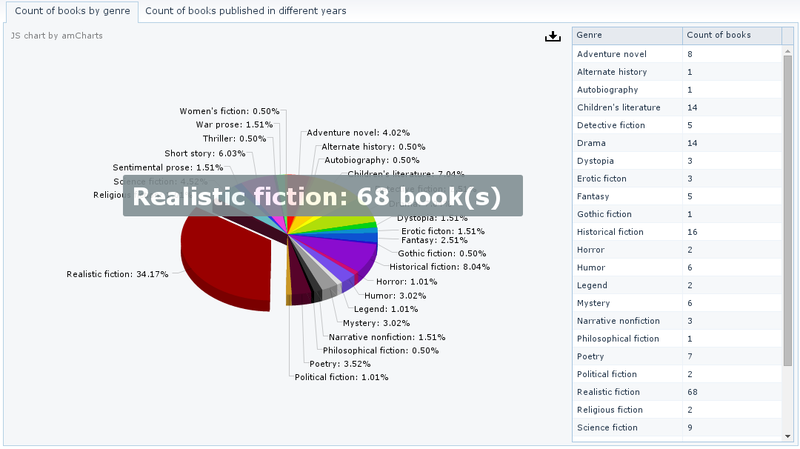 Names and values are displayed using the genre and countOfBooks attributes of the BooksByGenre entity; the list of instances for this entity is stored in the datasource. The datasource is also connected to a table that shows the same data as the chart. angle - defines the chart angle. May have a value from 0 to 90.
balloonText - defines text for the tooltip that appears when hovering over a pie slice. You can use the following tags: [[value]], [[title]], [[persents]], [[description]], as well as keys from the DataItem listed in a DataProvider instance, or names of the entity attributes from the datasource. depth3D - chart thickness. When used in combination with the angle attribute, helps to create a 3D effect. titleField - a key from the list of pairs contained in the DataItem objects listed in a DataProvider instance; this key is used to determine the name of a pie chart slice. valueField - a key from the list of pairs contained in the DataItem objects listed in a DataProvider instance; this key is used to determine the value of a pie chart slice. chart:legend - defines chart legend. The position attribute defines the location of the legend relative to the chart, and markerType defines the shape of the information marker for pie chart slices. chart:exportConfig – enables chart export. The menuTop, menuLeft, menuRight and menuBottom attributes define the Save button location. In our example, the button is located in the top right corner of the chart. The chart:menuItems element contains export settings. In addition to the png format used in our example, the chart can also be exported as jpg, svg or pdf. The icon attribute contains a path to an image that should be used as an icon for the export button. This chart retrieves data through the DataProvider created in the controller (see below), so the datasource attribute is not defined. categoryField - a key from the set of pairs contained in the DataItem objects listed in a DataProvider instance; this key is used to determine the labels for the category axis. chart:chartCursor - an optional element adding a cursor to the chart; the cursor follows the mouse pointer and shows a tooltip with the value of the corresponding point on a chart. chart:categoryAxis - an element that describes the category axis. Setting startOnAxis to true causes drawing the chart right from the value axis. The default value for this attribute is false. In this case, there will be a small gap between the value axis and the chart. The title attribute defines the title of the value axis. chart:valueAxes - an element that defines vertical value axes. In our case, only one vertical axis is used; the axis is described by the chart:axis element. The position attribute defines position of the value axis relative to the chart. Setting stackType to REGULAR makes the chart display a rolling value. Setting this attribute to none refers to a non-rolling value. The initPieChart() method populates the pieDs datasource with the data retrieved from the service. The refresh() method initializes the datasource. This method should be invoked regardless of the refreshMode="NEVER" attribute declared in the XML-descriptor. setFillAlphas(0.6) - defines fill opacity. setLineAlpha(0.4) - defines graph line width. Possible values are from 0 to 1.
setTitle(publisher) - defines the graph title. setType(GraphType.LINE) - defines data display style. setValueField(publisher) - a key from the list of pairs contained in the DataItem objects listed in a DataProvider instance; this key is used to determine graph values. setBaloonText(publisher + " - [[year]] year: [[" + publisher + "]] books") - defines tooltip content. Below are the screenshots of the screen that we have just created. Add the screen to the menu, then rebuild the project using Run -> Restart application server and log in to the system. Open the statistics screen. 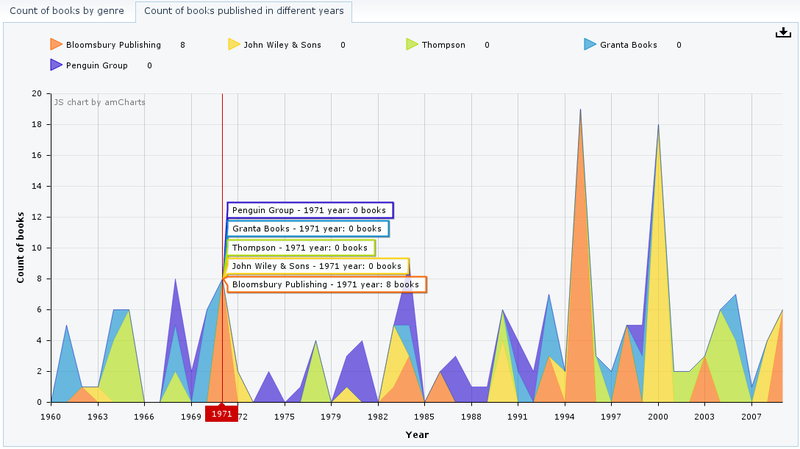 The rolling chart illustrates the cursor showing detailed information on the number of books issued by the publishers during the selected year. To see the results, rebuild the project using Run -> Restart application server and log in to the system. Open the screen and click one of the pie slices to shift it out. CUBA platform map display subsystem is based on integration with a third-party map service provider. Currently, only Google Maps service is supported. Adding markers. Marker may be either fixed or draggable by user. Markers can process mouse clicks and send corresponding events to the screen code. cuba.charts.map.useBusinessApiKey = true - commercial key flag. cuba.charts.map.clientId - client identifier, may be mandatory depending on the map service provider. Mandatory for Google Maps. cuba.charts.map.defaultZoom - default zoom level for the map. cuba.charts.map.defaultLatitude - default latitude of the map center point. cuba.charts.map.defaultLongitude - default longitude of the map center point. cuba.charts.map.provider - map service provider, google by default. You can display maps in your application screens using the com.haulmont.charts.gui.components.map.MapViewer component. id, width, height - standard component properties. mapType - map type corresponding to the MapViewer.Type: roadmap, satellite, hybrid, terrain. Default is roadmap. vendor - map service provider. Currently the only supported value is google. setZoom() - sets the map zoom level. setCenter() - sets the map center point. setVisibleAreaBoundLimitsEnabled() - enables visible area limitation mode. 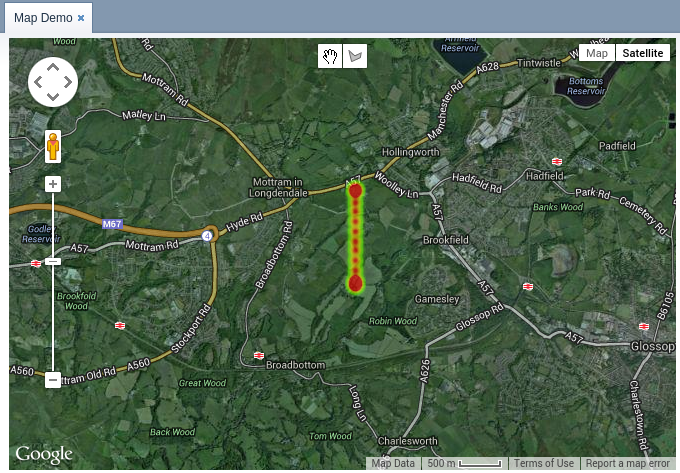 setVisibleAreaBoundLimits() - sets boundaries of the visible area of the map. 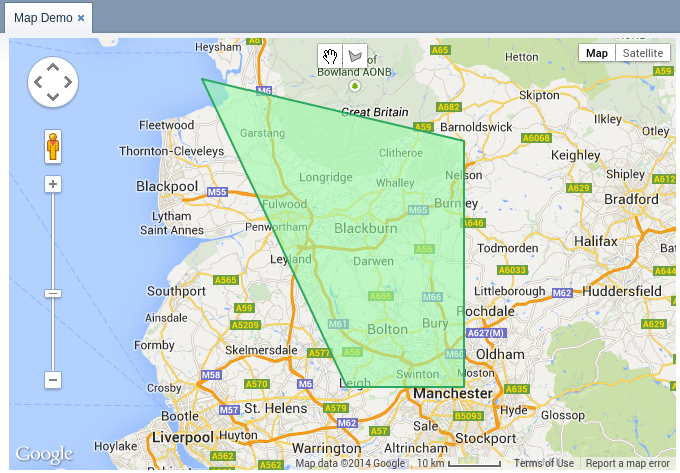 fitToBounds() - sets the minimum map zoom as the one which will be sufficient to show in full an area limited by north-eastern and south-western coordinates. setMaxZoom() - sets the maximum available zoom level. setMinZoom() - sets the minimum available zoom level. setDraggable() - enables/disables map dragging mode. setKeyboardShortcutsEnabled() - enables/disables keyboard shortcuts. 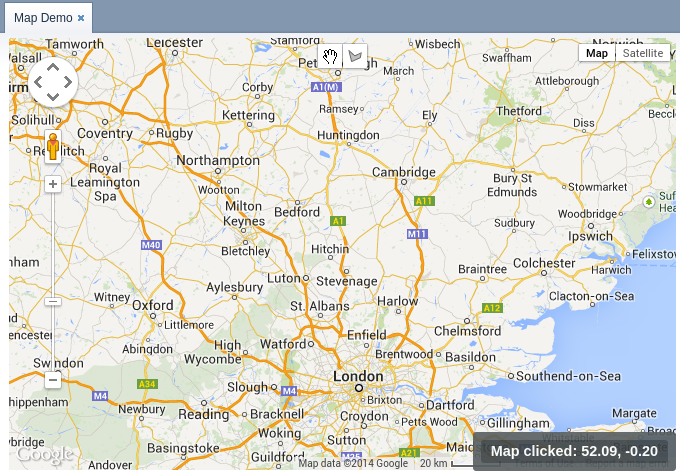 setScrollWheelEnabled() - enables/disables map zoom with a mouse scroll wheel. setMapType() - defines map type. The data used for the heat map layer can be changed using a separate setData() method. This change does not require re-adding the layer to the map. MapMoveListener - user drags a map with a mouse button pressed. 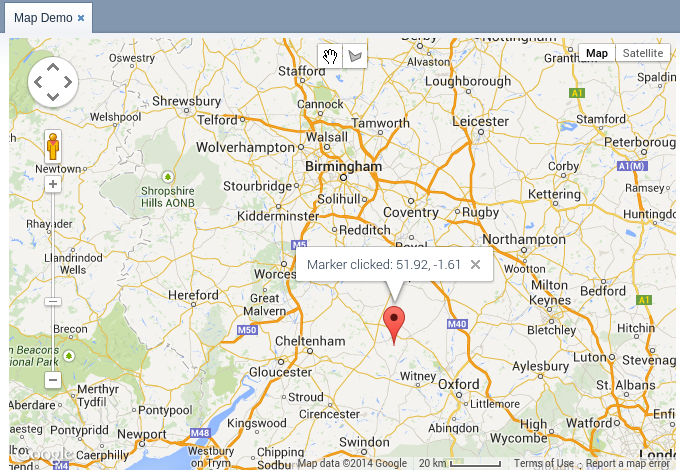 MapClickListener - user clicks on a map. MarkerClickListener - user clicks on a marker. MarkerDragListener - user drags a marker. InfoWindowClosedListener - user closes an information window. PolygonCompleteListener - user creates a polygon in map editing mode. PolygonEditListener - user edits a polygon (moves or adds a vertex to an existing polygon). MapInitListener - map initialization complete. This listener is invoked once after the first load of the map when all the tiles are loaded and coordinates are available. For a more detailed information about the methods and parameters of map components, please refer to the corresponding JavaDocs.